Gustav Möller’s nerve-jangling thriller about an emergency police dispatcher and one fateful call uses minimal ingredients to devastating effect. Jakob Cedergren gives a ‘tinderbox of a performance’ as police officer Asger Holm in The Guilty. The sharpest film-makers realise that cinema is not just what plays out on the screen; it’s also what unfolds in the mind of the audience. Show the viewer everything, in some kind of premasticated slop of pictures and story and you reduce them to passive consumers, chowing on movie comfort food. Invite them into the film as active participants, allow them to discover the picture from the barest bones of plot, and they will love you for it. It’s a lesson that first-time feature director Gustav Möller has learned early and learned well. 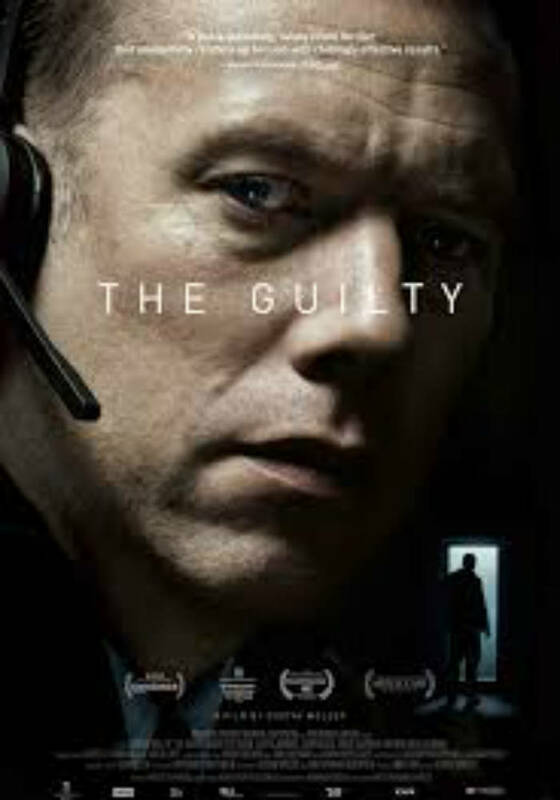 His superb, multi-award-winning debut, The Guilty, is a masterclass in wringing breathless tension from just a few key ingredients. The film takes place in two rooms and the story unfolds in a series of phone calls. A police officer temporarily assigned to emergency dispatch duty takes a desperate call from a kidnapped woman. The 75 minutes that follow are so taut that you almost forget to breathe. The ‘less is more’ message is one that bears repeating. The potential scope and ambition of cinema as a medium is immense. It is limited only by imagination, the special effects budget and perhaps the laws of public decency. However, something interesting happens when you start to impose restrictions. Film-makers are forced to use their wits, rather than their toolkit of effects and gimmicks. It’s a theory that has regularly been embraced by Möller’s Danish compatriot, Lars von Trier, who is perhaps the most enthusiastic fan of creative self-flagellation in the business. He was an originator of the Dogme 95 ‘vow of chastity’, which urged film-makers to strip their art down to its basic ingredients (the rules included no score, no effects, no added lights, handheld camera only, no genre movies) in order to focus on story and performance. The Guilty wouldn’t pass the austere Dogme criteria – it is lit and photographed conventionally and carefully. And the meticulously crafted sound design, particularly the punctuating moments of silence and stillness, is essential for its success. But the film’s narrow visual focus – much of the drama plays out in the face of police officer Asger Holm (Jakob Cedergren) – accentuates the crackling cleverness of a screenplay that allows us to unravel a mystery in real time. The raw-nerve jangle that this thriller delivers is partly thanks to a screenplay, co-written by Möller and Emil Nygaard Albertsen, which is as clever as it is deft. Steering clear of swampy patches of exposition, it’s a thrillingly lightfooted approach to storytelling that gives us just enough to work with in order to shape our own suspicions and conclusions. But a crucial part of the picture is Cedergren’s tinderbox of a performance. Police officer Holm has been taken off the street pending a formal investigation, which is scheduled for the following day. From his brusque manner, it seems he feels the emergency phone operator work is beneath him. But there’s something more than that. A brief, jovial chat with a former colleague from the city beat leaves him hollowed out and deadened. The camera creeps towards him as he stares, unseeing, at his desk and catches the glint of a tear in his eye. For reasons that eventually become clear, Holm very much needs to be a hero right now. When he answers a sob-choked call from Iben (voiced by Jessica Dinnage), Holm grabs at the chance to redeem himself. Without giving away too much – this is a film that plays best when you know the least – the dexterous reveals and twists land like a punch to the gut. Source https://www.theguardian.com/film/2018/oct/28/the-guilty-review-gustav-moller-telephone-thriller 28/10/2018, edited extracts, accessed 19/3/2019.